After you have learned the basic components of guitar blues such as dominant chords and 12 bar blues progressions it is time to expand your knowledge in different directions. In this article you will discover new skills. The chords above are E7, Esus13 and an E7 voicing (notice that the first and third chord is not identical). Play these chords in the sequence: E7 - Esus13 - E7 (II) - Esus13. In the end, you should try to put it all together with the A7 bundle, D7 bundle and E7 bundle a sequences. 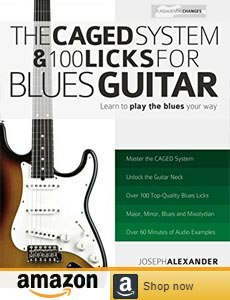 Acknowledge should be given to the book Blues Guitar Rules in which these chords and tabs are presented. Go to next article in the course: 12 Bar blues chords.